Stellar winds from massive stars strongly influence their evolution and local environment. The mass-loss rates for these stars tend to increase with increasing luminosity. This is because the winds from luminous massive stars are “line driven” – atoms in the stellar atmosphere absorb radiation and are ejected at high velocities. However, late-type O stars (i.e., O stars which have sub-types near the end of the sequence) have a problem – the measured winds of these stars tend to be smaller from theoretical predictions by nearly a factor of 100! This is known as the weak wind problem which applies to massive stars with luminosities less than 105.2 L☼. Although winds from many late-type O stars have been observed and measured, it is still unclear if theory strongly over-predicts or if the observed mass-loss rates are very sensitive to the methods used to determine their value. 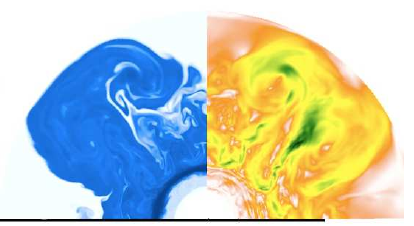 The winds from massive stars directly influence their environment through the formation of stellar wind bubbles and bow shocks. These structures are typically tens of parsecs and tenths of parsecs in size, respectively, and the size of these structures depend strongly on the mass-loss rate. Measuring these structures in a stellar cluster for an individual star can be quite tricky. Massive stars form in clustered environments and the bubbles from many stars can overlap making it impossible to constrain the wind properties of a single star. However, if the star is ejected from it’s natal cluster the wind bubble rapidly turns into a bow shock as the star burrows through the interstellar medium (ISM). The size and shape of this bow shock can allow one to constrain the wind properties of the star. This is because the characteristic size of the bow shock depends on the stellar wind momentum rate (which is just the product of the mass-loss rate and the terminal velocity of the stellar wind), the velocity of the star as it moves through the ISM, and the density of the ISM. In this paper, the authors discuss a new method to determine the mass-loss rates from runaway massive stars. These are stars that have been ejected from their stellar nurseries likely due to dynamical interactions with other stars. This method is able to constrain the mass-loss rate from runaway bow-shock producing massive stars based on the detection of well-defined HII regions located around these stars. An HII region is a region of ionized hydrogen surrounding a massive star due to the ionizing luminosity of the star. The size of an HII region (aka the Stromgren Radius) is determined by the density of the ISM, rate of ionizing photons produced by the star, and the rate at which ionized hydrogen recombines with electrons to form neutral hydrogen. The stand-off distance of the bow shock, on the other hand, is the minimum distance from the star at which the wind pressure from the star balances the ram pressure of the ISM and thus provides a direct dependence of the mass-loss rate, wind terminal velocity, and density of the ISM. Measuring these two structures eliminates the ISM density dependence (assuming a homogenous ISM) and allows one to constrain the mass-loss rate if the wind terminal velocity is known. The authors use this method to determine the mass-loss rate of a nearby popular runaway star, ζ Oph. Left: SHASSA Hα image of the HII region of ζ Oph. The circle denotes the star's location and the arrow denotes the direction of its peculiar (transverse) velocity. Middle: IRAS image of the same field showing the bow shock generated by ζ Oph as indicated by the dashed circle. Right: Spitzer image of the bow shock around ζ Oph. ζ Oph is a well-known and well-studied runaway massive star. It is a nearby ( d~112 pc as measured from parallax) late-type O star with an impressive bow shock and nearly spherical HII region, 9.6 pc in diameter, as shown in the figure above. The star has a space velocity of 26.5 km s-1, which has been determined from its measured proper motion, and the stand-off distance of the bow shock is 0.16 pc from the star. The authors adopt a terminal velocity speed of 1500 km s-1 from previous studies of this star. The theoretical estimate for the mass-loss rate of this star is quite large compared to previously measured values: 1.29×10-7 M☼ yr-1 (theoretical estimate), 1.43×10-7 M☼ yr-1 (measured estimate from observations of the Hα luminosity), and two estimates obtained from observations of the UV spectrum of Carbon which used different analytical methods to determine their mass-loss rate: 1.58×10-9 M☼ yr-1 and 1.30×10-8 M☼ yr-1 . Using the method described above, the authors find that the mass loss rate is 2.2×10-8 M☼ yr-1, which is approximately 6 times lower than the theoretical estimate.